With all this buzz about Qianhai and free trade zones in China, there are a ton of questions floating around on the internet. What is the fuss about? 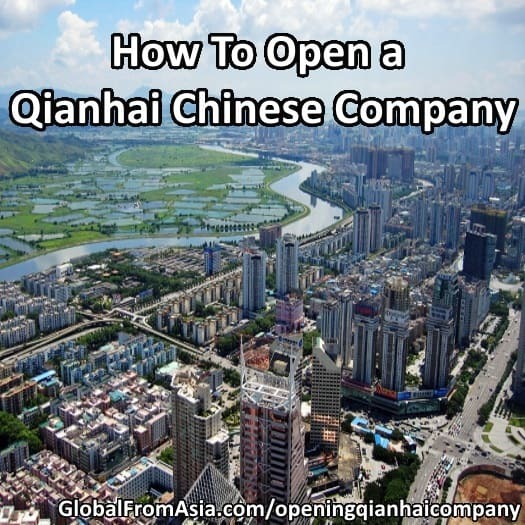 Let’s get to the bottom of the benefits and procedures for opening a Qianhai company. What is a Qianhai Chinese Company? First, what is it? Qianhai is a special district inside of Shenzhen, China that has been established to allow “free trade” between the world and China. What does that mean? Those who do product based businesses and are selling foreign products into China know the headaches of importing goods. By leveraging a free trade zone, you can delay the import process and send the goods to this special zone, in a bonded warehouse. It doesn’t mean you don’t ever have to pay import taxes on the goods, it just means you can delay the process until later. This helps you do business faster, and get the Chinese government to classify new products, and get your goods to the Chinese port without months of waiting for them to know what it is and how to tax it. But there is more to these free trade zones than just no import duties. The Chinese government is giving lower corporate tax rates (15%) to companies established there, overseas talent incentives, grants, and more. Qianhai has been nicknamed the Manhattan of Asia in certain marketing messages. While it has only been around less than 2 years, there is a big push for it to be a massive city by 2020. Not just a port, but residential, schools, shopping, so much that you don’t even have to leave the district. Also, Qianhai isn’t your only option for a free trade zone company. It is a hot one because it is neighboring Hong Kong, but there are ones in over 10 other cities in China. Policies and incentives vary a little bit between each, so look into the details if you’re going to incorporate your business there. There is a broad range of businesses that can register in Qianhai, not just for those importing foreign goods. There are service based companies, consultants, accountants, internet companies. The main point is that they want to have high tech, value add industries to improve society and the Chinese long term future. When you are going to register your company, make the case of how your business is cutting edge and innovative. This will help you when registering the company, and can even help you get some government support. There are programs that give free or much lower rent, but as there is such a huge demand of companies to incorporate in Qianhai already, there are less and less of these opportunities. The market message is that Qianhai wants to further bridge Mainland China to the world. This often was the role of Hong Kong, as a free trade port and gateway to China. So what does this mean for Hong Kong? Qianhai always gives special consideration to Hong Kong people and Hong Kong companies who want to open up shop there. They know that Hong Kong people have a talent shortage and need to find more skilled labor to grow their businesses. Qianhai wants to be that place, and has programs for doing so. Ok, so you’re convinced Qianhai is for you. What are the requirements for setting up? The government has a requirement for companies who establish in Qianhai to have a minimum registered capital of _____. You may be worried you don’t have this capital to invest in the business. Don’t worry – the money doesn’t have to be put up right away, and many agencies there have ways to help you delay the requirement of putting the capital investment in up front. Difficult to explain this in a blog post, so please talk to a specialist on a consultation meeting. Like anywhere, you need to pick a company name that hasn’t been picked before. You will need an address in Qianhai to get the company. And this has been getting more strict – originally people were just getting the serviced office /virtual office there and working in other parts of China. You can still get away with this, but the banking is a bit more strict now. Normally this will be done by an agency, and can range from $1200 to $3500 US dollars. The service depends on if you need English speakers, and how much of the process you want them to help you with. Some will literally just do the bare minimum and not have much service to offer. There are a host of incubators and grants and other programs the government is offering to attract quality and innovative companies there. This is on a case by case basis and is best done by being there on the ground. Another popular question is how long. Well, the company setup itself I’d say about a week to two (if your name search, address location are sorted out), but again, the banking is the long and challenging part. That can be a couple months or more. So I hope today’s overview of registering a Chinese company in the Qianhai Free Trade Zone has been helpful for you. Sure there are tons of nitty gritty details, and things do depend on your current business, and knowledge (and patience) of business in China. As always, I’d love to hear from you. Please leave a comment below with questions or concerns you have and let’s get this process smoothed out for international business owners around the world!